Located 12 miles / 19 km south of Knoxville, TYS has no public ground transportation, but plenty of taxis, limousines and shuttles serve the airport. Most of the large hotels in and around the airport offer courtesy shuttle services to and from downtown. With the Hilton Knoxville Airport located onsite at the airport and several other large hotels in the immediate area, there is no shortage of complimentary airport pickup and drop-off services and many hotels have their own free shuttle service to popular destinations in and around the city. 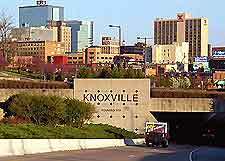 Over ten cab companies and six limousine company operate from the airport and serve destinations in and around Knoxville. Taxi stands are located just outside the Baggage Claim area on the first floor of TYS terminal.